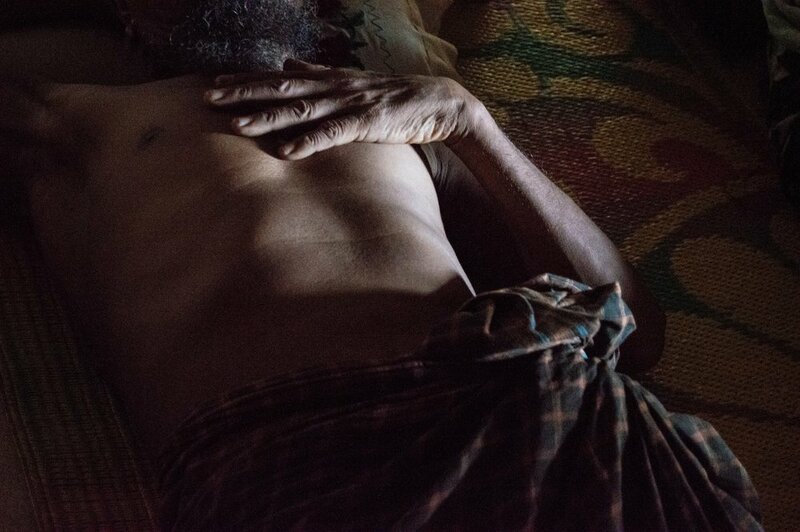 A PHOTO ESSAY ON "THE MOST PERSECUTED MINORITY ON EARTH"
The Rohingya are a minority group who have lived in their ancestral homeland, in what is now Myanmar, for generations. Predominantly Muslim, they have continuously been the targets of persecution by the government and local vigilantes. In August 2017, they were subjected to a brutal ethnic cleansing campaign by the Myanmar military, police, and civilians. Many were trapped in their villages, starved, raped, shot, and drowned. Those who escaped and survived the treacherous journey to neighboring Bangladesh now live in the largest refugee camp in the world, numbering some one million people. Unable to return to Myanmar, and unable to leave the camps in Bangladesh, they are stateless and live in a kind of purgatory. This man and a group of other men from his village described a nightmarish experience. Their village was surrounded with barbed wire, with constant harassment from the local population and police, and no food for 45 days. People resorted to eating leaves, and several died from starvation. On the afternoon of August 26, 2017, military, police, and local vigilantes attacked. They used guns to mow people down, and RPGs set their homes alight. Many of the women and girls were raped, and some were subsequently killed. Some people managed to escape to a lake behind the village to hide, but several drowned. One man described hiding fully submerged with only his nostrils and eyes above water, watching helplessly as his family were killed and sister was raped. In all, 358 of their village of roughly 1400 were murdered in one day. "To them," one said, "our lives are worth less than a dog's." "Now we are here and no one cares," said another. "I feel like we are lost, floating in the sea." This girl, whose name is withheld, was shot in the leg as she was fleeing with her family. 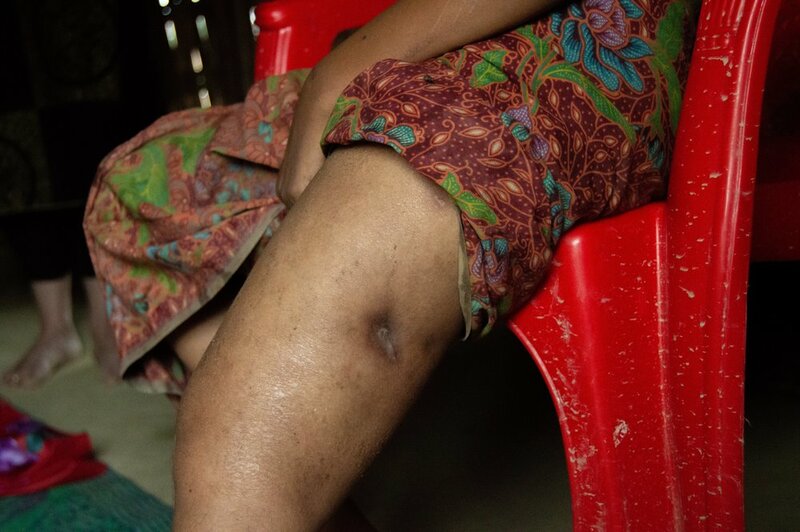 She recounted feeling a searing pain in her leg and passing out in the waters of a rice field. Faced with a barrage of gunfire, her family kept running. Several hours later, she woke up in the dark in a pool of her own blood and waited. Her mother returned for her before dawn and they pushed on to Bangladesh. A man stands outside his shelter in "No Man's Land" between Myanmar and Bangladesh. Those who want to remain as close as possible to their homeland live here. After they forced the Rohingya out, the military built the barbed wire fence in the background to stop them returning. The atmosphere here is tense, with Myanmar military outposts on the hills just behind the camp broadcasting anti-Rohingya propaganda over loudspeakers. Bangladeshi military strictly control access on their side. The week after this picture was taken, Myanmar soldiers, unprovoked, opened fire and shot a child.